The crowd instantly understood what he meant, erupting in delight for the thousandth time, their constellation of glowing light-stick orbs flashing against the night sky. 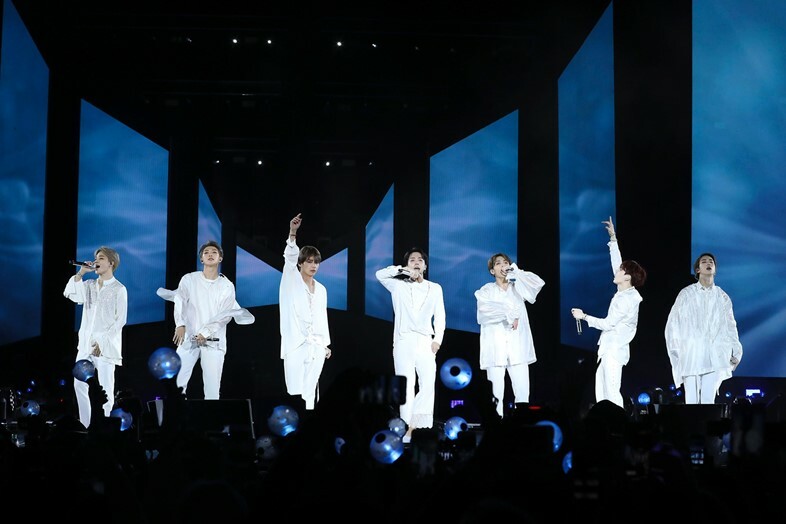 Record-breaking South Korean pop group BTS were here for their first ever American stadium show at Queens’ Citi Field, closing out the North American leg of their sold-out Love Yourself tour. In the process, the seven-member band had made history as the first Korean musicians to ever do so – as 24-year-old group leader RM proudly noted in an emotional speech during the band’s encore. 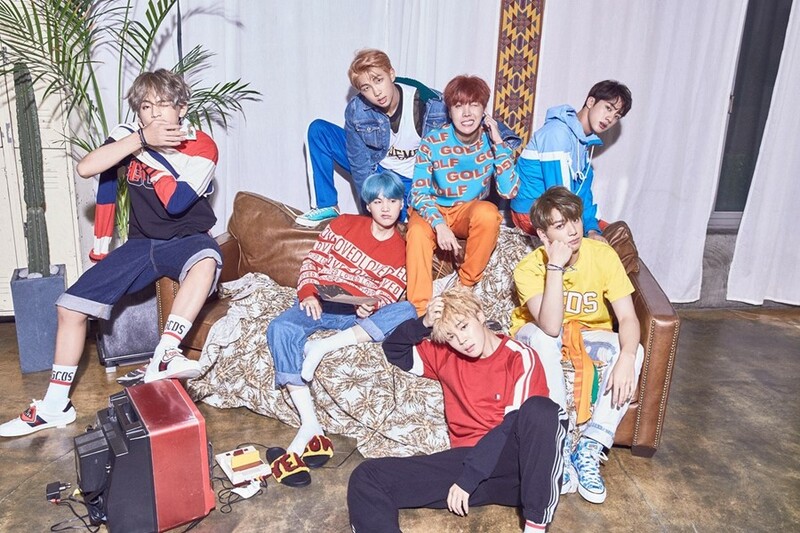 Alongside rapper/producer Kim Namjoon, BTS are vocalists Kim Tae-hyung (“V”), Kim Seokjin (“Jin”), Jeon Jung-kook (“Jungkook”) and Park Jimin (“Jimin”) and rapper/producers Min Yoongi (“Suga”) and Jung Hoseok (“J-Hope”). As a group, they hail from Seoul, South Korea, where they are unrivalled as the most internationally successful act the country has ever produced. With two No. 1 Billboard albums in a year and four Hot 100 hits, including a Top 10, they are pioneering what a foreign language act can achieve in North America. Now, they’re setting their sights on Europe and beyond. This tour has proven how dedicated BTS’s fans (also known as their ARMY) are – not just in Korea, but here in the US. BTS’s music is mainly in Korean, which is generally a barrier to English-speaking media featuring their music. On Saturday, the band showcased their Love Yourself album trilogy (Her, Tear and Answer), but also peppered in early key tracks (the caustic rap track “Silver Spoon (Baepsae)”) and their break-out hits. Solo performances, many of which were stand-outs of the night, ranged from UK funky jams to breezy Michael Jackson-esque pop. Their recent hits “Mic Drop” (with its menacing “Get Ur Freak On”-sampled bassline) and the genre-defiant rock/dream trap of “Fake Love” proved the night’s stadium-shakers. Despite the songs being in Korean, the ARMY knew every single word – and they’d created their own custom fan chants, too. To attend a zeitgeist-defining pop concert means you’re witnessing the most exciting act in the world right now. The 2018 BTS live experience proves that they are of that calibre. Some have brought up The Beatles at Shea Stadium,1966 as a comparison point – and while it might sound like hyperbole, in my eyes, it’s not an exaggeration. In person, the crowd energy is beyond anything else I’ve witnessed at a pop concert. (Fun fact: Citi Field now stands where Shea Stadium once did.) Another relevant parallel would be Lady Gaga on her Monster Ball tour in 2009. That was right when she was truly ascending, subverting the mainstream while shaping it, and attracting a fiercely devout cadre of fans — her ‘little monsters’. Like prime Gaga, BTS offer something refreshing to those weary of the usual antics of pop stars. The band strongly advocates for inclusivity, preaches self-love, and offers strength for those who may identify as underdogs. The band recently made headlines by appearing at the United Nations General Assembly to help launch UNICEF’s new program, Youth 2030. (Through their Love Yourself album proceeds, they also have raised over $1 million for the organisation.) RM’s speech on his journey towards self-acceptance trended worldwide, and was praised for its from-the-heart candour, allowing the band to reach yet new sectors of the public. And then there’s this generation of little monsters: the ARMY. BTS’s fans are notably diverse in race and age, proudly LGBTQ-friendly, and to me, they look like the future. The fact that members of the ARMY are seeking music outside the western pop hierarchy also suggests an openness to new experiences, and a breaking free from top-down hegemony of mainstream pop culture. For those drawn to BTS, the language barrier quickly ceases to be relevant.